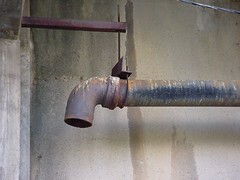 While we all gush about Google's recent aquisition of YouTube, the owners of pipe manufacturer Universal Tube are bleak. "It's killing us," said Ralph Girkins, president and owner of the 22-year-old business. "All my worldwide reps use our Web site. Customers all over the world use it to bring up photos of the machinery, descriptions and specifications there. Shame... hopefully Google or YouTube will host the site for him so he can get back online.